A rising number of PP buyers have been reporting unsatisfactory demand for their end product applications across the globe as per the pricing service of ChemOrbis. This has caused trading activities to be at a stalemate in many spot PP markets including China, Southeast Asia, Turkey and Italy, where producers and traders are reluctant to concede to a downturn despite the ongoing demand lull because of the spike in energy costs. 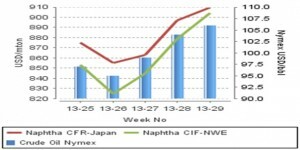 When looking at the upstream chain, crude oil prices on NYMEX were trading at around $96/bbl on average as of the last week of June. They breached the $100/bbl threshold in the first week of July before hitting the $106/bbl level mid-last week. Although crude oil contracts somewhat retreated in the following few days, they have made a firm start to this week again, trading at around $106/bbl. 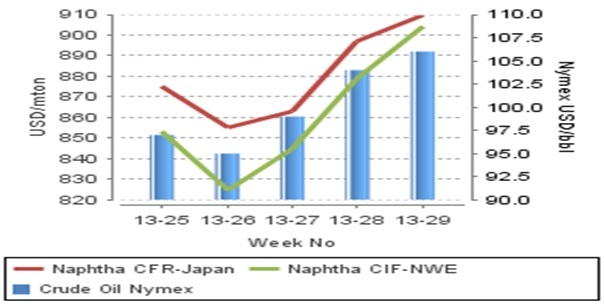 Spot naphtha values have also been responsive to these weekly gains in crude oil with European naphtha prices posting an approximate increase of $100/ton in the past three weeks while Asian prices recorded a $55/ton hike. In the midst of soaring energy costs and sluggish demand on the buyers’ side, PP markets have been facing limited trading activities. In China, demand has not been encouraging for quite some time in line with the slowing growth figures of the country for two quarters in a row. Overseas producers have started to approach the PP market mostly with rollovers. A large sack manufacturer in Turkey complained about their slowing business as well. “We don’t have sufficient orders for a month ahead. Hence, we have decided to slash our run rates like many converters in the market. There is no point in running down our raffia stocks when we are not able to sell.” Many players also agree that the appreciation of the US dollar and the Ramadan lull contributed to the weakness of the market, which resulted in modest discounts in the local and import market from early July. According to ChemOrbis, converters in Italy are now reporting concluding their July PP deals at rollovers from last month despite sellers’ initial attempts to hike their offers. “We are not planning to make additional purchases for this month now that we have sufficient stocks,” said a buyer. Players expect demand to lose further speed in the upcoming days in Italy as converters are unlikely to build stocks ahead of the holidays, with some planning to cut their operating rates in August. Hence, several buyers voiced their rollover expectations for August despite the higher energy costs.